Frentis: The woman, who has mind-slaved Frentis into helping with her murders, kills an old gifted man and drinks his blood, which gives her the ability to cast fire. Vaelin: The king names Vaelin Tower Lord of the Northern Reaches, basically exiling him to the frontier, from where his fame can be no threat to the monarchy. Unfortunately, this book is very poorly plotted. Once we reach its end, we realize there are actually only two events that really turn the plot (they happen at the Midpoint and the Climax). As such, we find beats at most of the proper moments in the timing, such as right here at the Inciting Event, which seem important at the time. But as the story continues, it becomes clear they were either extraneous to the story (Lyrna’s beat) or could have been summarized elsewhere or better developed to make them more intrinsically meaningful to the greater plot (Frentis’s beat). Vaelin’s exile to the Reaches is the setup for the coming conflict, but only in an indirect way. His main conflict will turn out to be gathering an army and hurrying down from the Reaches to save the Realm, but that conflict actually arises at the Midpoint, rather than the First Plot Point. Lyrna’s time with the Lonak turns out to be completely nonessential to the story (save for the single important development of her learning to throw a knife). Frentis’s interaction with “the woman” seems crucial at the time, but turns out to be ancillary to the main conflict, since the woman and her ability to cast fire matters only at the Midpoint, before the story shifts to focus on other antagonists. Frentis: For the first time, Frentis is able to resist the mental “binding” that enslaves him to the woman. It allows him to disobey her direct order to kill the heir to the neighboring Alpiran kingdom. This is an important moment for Frentis, but because his conflict with the woman only lasts through the Midpoint, it is ultimately the wrong choice for this all-important early plot catalyst. Vaelin: He arrives to take his place as Tower Lord in the Northern Reaches. Beyond the shift in setting—from Normal World to Adventure World—little happens here. The seemingly important revelation of a gold strike ends up having little bearing on the rest of the story. This is the moment in Vaelin’s story at which he should now be firmly entangled with the main conflict—but so far he is only vaguely aware of the greater threat to the realm and has no particular goal. Lyrna: She witnesses the Lonak’s holy volcano seemingly kill the false Mahlessa, then escapes an ambush and arrives to visit the true Mahlessa, the Lonak leader. Again, this has nothing to do with the main conflict. Lyrna’s time with the Lonak could have been completely excised from the book without altering the Climax in the least. Frentis: “The woman” tries to kill Hentes Mustor, the Fief Lord of the important city of Alltor, but she is nearly killed herself. This scene introduces the character of Hentes Mustor, who will be important in the second half. But it doesn’t do much to emphasize the antagonistic power or the stakes—any more than any of the previous scenes in which the woman forces Frentis to kill for her. Vaelin: He rides out to meet the dreaded Horde—which has been set up as a seemingly primary antagonistic force. However, he discovers that instead of posing a threat themselves, the Horde is, in fact, running from the decimation of the Volarians. This finally presents the main conflict with the Volarians. We’ve seen hints of it in Frentis’s storyline, since the woman is working on the Volarians’ behalf. But this is the first time it has directly impacted Vaelin in any obvious way. Really, despite all the obfuscation of meaningless events in the first half of this book, this is Vaelin’s true Inciting Event: this is the moment when he first brushes the main conflict. Lyrna: In a privileged meeting with the Mahlessa, Lyrna learns some grave threat is coming from “the Dark” and she is prophesied to play a role in events. This, too, is really Lyrna’s Inciting Event. However, there’s no good reason it should have taken this long to develop the entire (and mostly unnecessary) Lonak subplot to get her to this moment. Reva: A fourth POV character (whose story is structured pretty loosely up to this point) also finally faces down the main conflict when she saves her uncle Hentes Mustor from assassins and is basically adopted by him, despite her previous prejudices against him. Midpoint: The Volarians capture the capital city. “The woman” forces Frentis to kill the king. Lyrna throws a poisoned knife at Frentis, which finally breaks the woman’s hold over him. The woman burns Lyrna’s face, and Frentis kills the woman. Finally, something happens. The main antagonists show up, and the plot swings into something akin to motion. However, we can also see the weaknesses showing through here, most notably in the fact that the protagonist, Vaelin, is not involved in this scene and only reacts to it later after finally hearing about it. The death of “the woman” also presents some problems. Up to this point, she has been set up as the primary antagonist. Now, suddenly, the story shifts entirely to focus on the Volarians. It’s true both the woman and the Volarians are working at the behest of a greater antagonist behind the scenes. But because the woman was set up so prominently in early scenes, her absence in the second half feels like a void. One of the main reasons the first and second halves of this story feel completely different is because they’re focused on different conflicts: the woman in the first half (even though Frentis is the only one opposing her) and the Volarians in the second. Vaelin: He gathers an army and goes on the march against the depredations of the Volarians in the south of the realm. Lyrna: After being captured by Volarian slavers, she finally engineers an escape. Reva: At her dying uncle’s behest, Reva prepares the island city of Alltor for a siege. Frentis: He gathers a motley band of resistance and begins conducting a guerilla war against the Volarians. These are all pretty solid pinches. 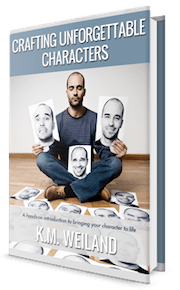 They emphasize the antagonistic force, the stakes, and create movement in the plot that turns the characters toward the final act. Vaelin: Vaelin doesn’t have much a turning point at all here. Frentis: Frentis has probably the strongest Third Plot Point, when his camp is found and decimated by the enemy, forcing him and his band on the run. Reva: Reva faces down siege engines, which is also a nice low moment. Lyrna: Lyrna, however, doesn’t experience much of a low moment at all, as she is forges an alliance with the neighboring island kingdom and claims her new title of Queen. Climax: All four characters head to Alltor for a final confrontation with the Volarians. Vaelin breaks the siege in time to help Reva. Lyrna arrives at the last minute to scare off the Volarian navy. Frentis joins up with his old master (but never actually makes it to Alltor). This is easily the best and most meaningful part of the story. It’s just a shame that nothing much led up to it in the previous five hundred pages. Climactic Moment: Vaelin nearly kills himself by overusing his “song” to find the enemy’s weak spot and break the siege. He meets “the woman” in a dream of the afterlife, which at least brings her character full circle in some small way. Resolution: Lyrna arrives to claim her kingdom and plan a new line of defense against the continuing Volarian attack. Notes: I loved the first book in this series. Blood Song was my favorite read last year, not least because of its tight focus on a single narrator and its deliberate and lush character development. I simply adore the protagonist, Vaelin al Sorna, and his brothers. 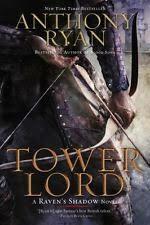 Naturally, Tower Lord was one of my most highly anticipated sequels ever. Vaelin is still great. The characters (for the most part) are still wonderful. The action is still tight and interesting. The stakes are still gripping. But beyond that, the deliberate change in style in this book chucks everything else that was great about the first one. Instead of focusing on Vaelin, the story is now divided equally amongst four POVs, including that of a brand-new character. Most of these POVs are functional, but none of them are as interesting as Vaelin’s. Not only that, but Vaelin is barely present in any of the other POVs. In short: the best character was suddenly reduced to having screentime in a bare quarter of the book. Worse than that, the plotting is largely meaningless. There are only two events in this entire book that turn the plot. Only two things that actually happen. 1. The Volarians attack at the Midpoint. 2. Vaelin breaks the siege on Alltor in the penultimate chapter. The entire first half of the book could literally have been reduced to a few paragraphs of backstory for each character: Vaelin is exiled to the Northern Reaches. Lyrna makes peace with the Lonak. Frentis is mind-slaved to a monster. Finally, unlike the first book, meaningful relationships between characters are all but nonexistent. Vaelin and his brothers share little screentime and no advancement. Vaelin and Lyrna don’t even have a conversation. Vaelin gets to know his sister a little bit, but the relationship doesn’t affect the plot or his development in the least. And Sister Sherin, Vaelin’s former love interest, has apparently been written out altogether. I’m vastly disappointed in this book because there’s absolutely no reason it couldn’t have been just as good as the first, had the decision to “add value” via extra POVs not obliterated what was an extremely solid style of storytelling. It takes so much discipline for an author to tell a story from a single POV (especially when that story is fantasy). I was excited to find it done so well in Blood Song. Unfortunately, however, Tower Lord is a prime example of how multiple POVs can weaken a story instead of strengthening it. Still, I won’t say I didn’t enjoy much of the ride. The second half of the book at least picks up the action and becomes very readable. Ultimately, I would read it all over again just to get to that moment in the second-to-last chapter when Vaelin finally unwraps his sword. But the overall feeling I’m left with is disappointment. Something moves against the Realm, something that commands mighty forces, and Vaelin will find to his great regret that when faced with annihilation, even the most reluctant hand must eventually draw a sword. By Anthony Ryan. Receive Updates of New Story Structure Analyses!